Features: Optional homepage layout, social links, mobile "click" menu. Form pages can be modified and/or duplicated. Can be combined with other Minisite templates. 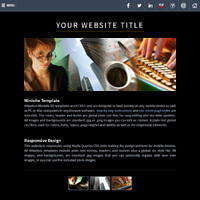 Details: HTML5 / CSS3 JPG images, text or graphic header. Responsive for all devices, smartphone, tablet, desktop, laptop. 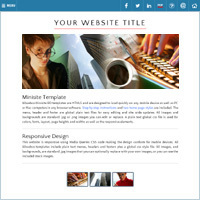 Basic HTML5 web templates with easy to replace .jpg and .png images. Any Minisite from the Minisite RD group can be combined. You can purchase any number of models and combine them for extra features. Stock photos included, Allwebco Business Minisite webpage templates are HTML5 CSS3 responsive designs that include Media Queries code to allow them to be viewable on all devices, Mac and PC computers, tablet and surface as well as smartphones of any size. No graphics editing or special software is required. Can be edited using any plain text or wysiwyg web software. Menus are plain text to allow for webpages to be added and removed as your project requires. Styles, colors and fonts can all be edited in the plain text global css file. We include the best support center in the industry as well as full support for all of our designs. Why is a Business Minisite Your Best Choice? Built as complete websites with multiple pre-formatted webpages, Allwebco Minisite business webpage templates are self contained, stand alone ad free HTML designs. Your site info can be simply plugged into the pages using any wysiwyg or plain text software. Any page can be duplicated for unlimited site expandability. Menus are plain text and the header, footer and menu are plain text global files for quick site updates. Standard multi-field contact and quotes forms are included. Created for better SEO, our designs are mobile friendly and will rank well for searches, desktop and mobile at Google and other search engines. Can be returned within 30 days for a full refund plus a free extended download service is included. When any webpage template is updated you can request a new free version download. Free scripts and add-ons are available plus we offer full site support and the most comprehensive support area in the industry. Allwebco business Minisites are sold exclusively on the Allwebco website.